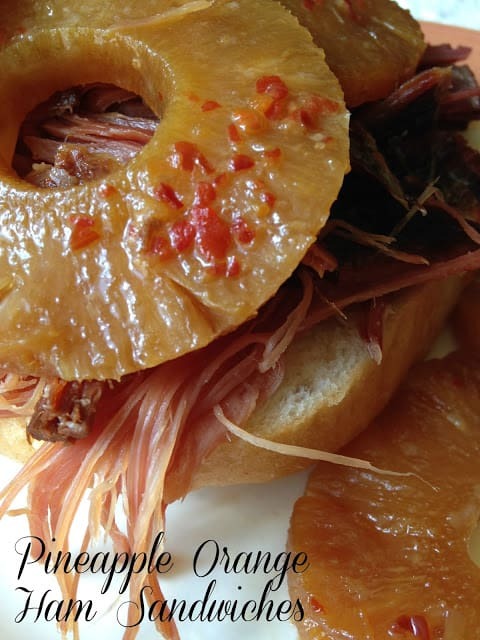 Easy Pineapple Orange Ham Sandwiches are so sweet and spicy. This recipe which includes orange marmalade, pineapple slices and crushed red pepper flakes will take these ham sandwiches to a whole new taste sensation. Why are these sandwiches called “easy”? Easy Pineapple Orange Ham Sandwiches are made in your slow cooker and this recipe has only five ingredients. Can’t get much easier than that. With the football season and the holidays right around the corner, you’ll want to keep this recipe in mind. Fast, easy and beyond delicious. Sweet comes from the pineapple slices, brown sugar and orange marmalade with the heat coming from the red pepper flakes. 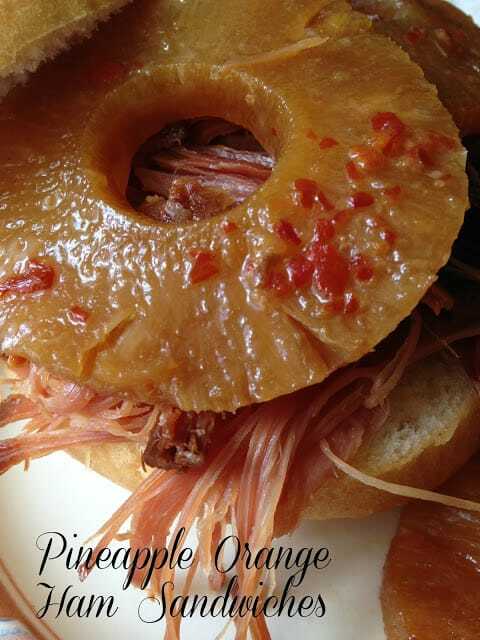 These sandwiches are served with the pineapple slices on a good, buttered roll. If mustard is a must on ham (I can relate) a Dijon mustard or Dusseldorf mustard would work. Drain pineapple; reserving juice; set juice aside. Place half of the pineapple slices in an ungreased 5-quart slow slower. Mix together reserved pineapple juice, orange marmalade, brown sugar and red pepper flakes. Spoon marmalade mixture over ham. 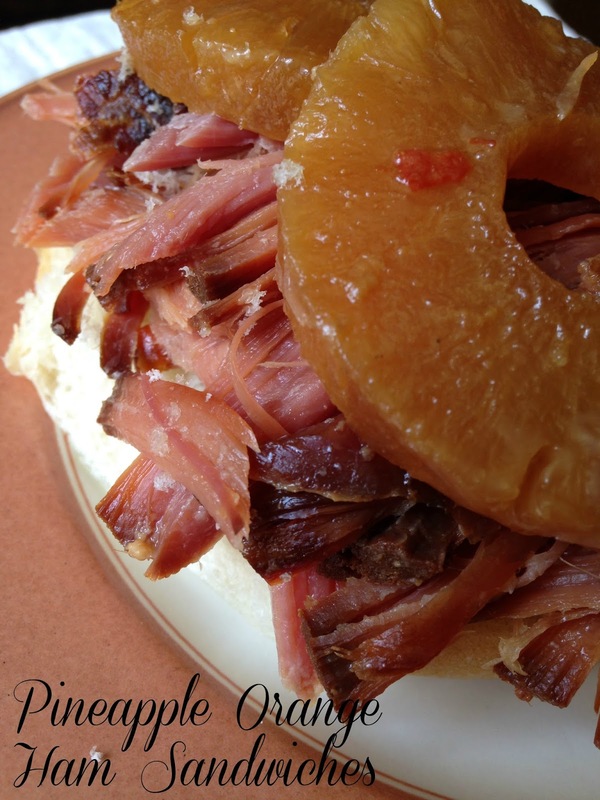 Top ham with remaining pineapple slices. Cover and cook on low for 5 to 6 hours or until heated through. Cut ham if needed, for cover to fit on crock pot. Remove ham to platter, with two forks, shred ham. Return to slow cooker and cook an additional hour on high. 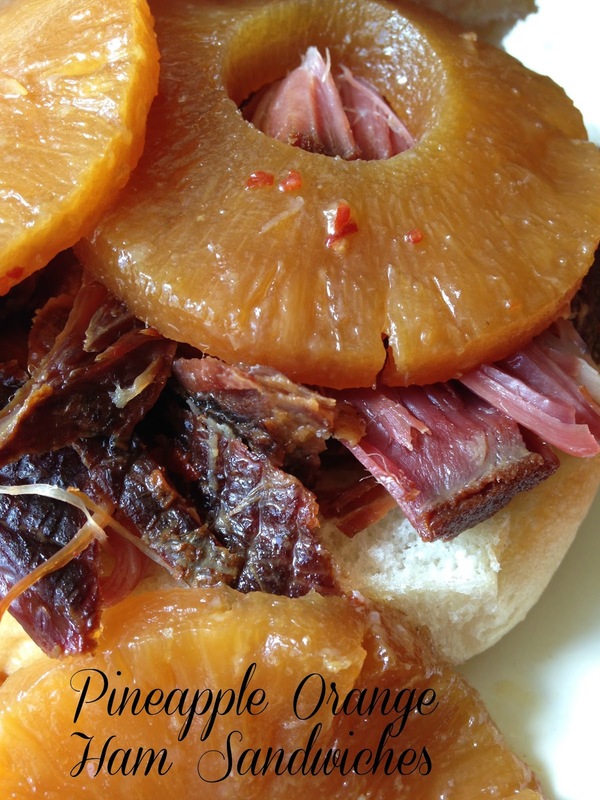 Spoon ham on buns or rolls and serve with pineapple slices. I am making 100 of these little sandwiches for a party in April. Can I just make the sauce and spoon over the ham? Any other suggestions other than borrowing 5 slow cookers?